A thrilling collection of short stories, verse, and art that challenges the boundaries of modern horror, science fiction, fantasy, mystery, and more. Over 250 pages of wildly imaginative creative work. 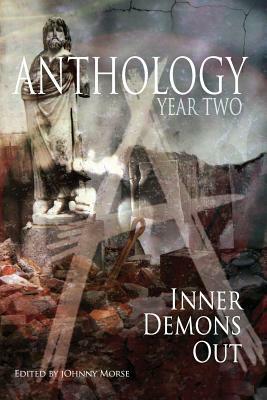 AY2: INNER DEMONS OUT joins its predecessor (ANTHOLOGY: YEAR ONE), and its successor (AY3: DISTANT DYING EMBER), in showcasing some of the year's best writing and art. From the minds of guests of ANTHOLOGY (AnthoCon), Northern New England's only Multi-Genre Literature and Arts Convention, comes a compendium of imaginative prose, poetry, and art. FEATURING WORKS FROM: Meghan Arcuri - T. G. Arsenault - Michael Bailey - David Bernstein - Tracy L. Carbone - Scott Christian Carr - Victorya Chase - Robert Davies - Mandy DeGeit - Timothy P. Flynn - John Goodrich - Scott T. Goudsward - Marianne Halbert - Stacey Longo - Kevin Lucia - Bracken MacLeod - Michelle Mixell - G. Elmer Munson - Holly Newstein - David North-Martino - Errick A. Nunnally - Craig D. B. Patton - Susan Scofield - B. E. Scully - Julie Stipes - Andrew Wolter - K. Allen Wood - Richard Wright - Candace Yost - T. T. Zuma... Learn more at www.anthocon.com.